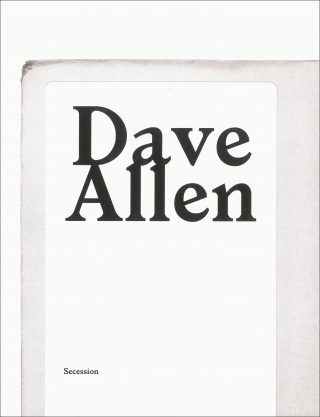 Dave Allen’s artistic practice is characterized by a strong interest in music. 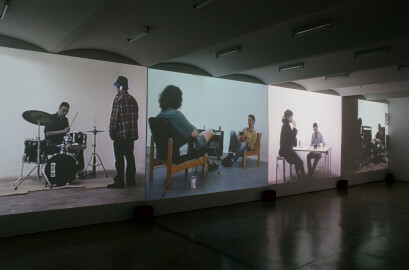 In the early 1990s he took a keen interest in the collective experience of pop and rock and their function in establishing identity within youth culture. More recently he has been working more and more with compositions of contemporary experimental music. In his transformations and translations into video installations, performances, drawings, sound installations, and works for radio, methods of textualization and communicative processes in general are significant. 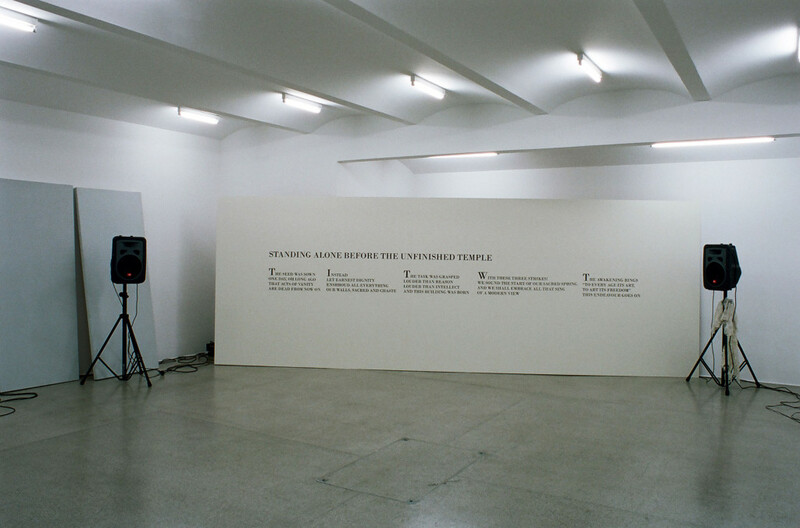 The sound piece / wall drawing Canon to the Hammer of the Gods, which Dave Allen has created for the Secession exhibition, addresses on several different levels the phenomenon of myth creation and society’s approach to it. A leading and integrative motif in this work — which includes a performance — is the triple beat of a drum or hammer. Using a form of sampling and mixing that is reminiscent of musical methods, Allen is able to interweave very different (historical) themes in free association, and to thereby create a new and unusual narrative line. In 1973 the legendary drummer Cozy Powell (among others, a member of the hard rock bands Black Sabbath and Whitesnake) had a hit in the UK charts with Dance with the Devil. Powell, who died young, became a source of inspiration and identification for many young drummers. In Canon to the Hammer of the Gods Allen adds lyrics to the beats of this Cozy Powell instrumental, freely telling the story of how the foundation stone of the Secession was laid. The foundation stone of the Secession building was laid on April 28, 1898, and the story goes that Gustav Klimt, the president at the time, marked the event with three blows of a hammer. Among those in attendance were the honorary president Rudolf von Alt and founder member Alfred Roller, as well as a number of on-lookers, and speeches are said to have been held, although no records exist today. Dave Allen’s performance to accompany his exhibition rounds off the associative circle of mythologies with an interpretation of the Nordic legend of Thor, the god of thunder. As an attribute of his strength Thor has a hammer, which was once stolen, as was the hammer that Klimt used in the Secession foundation stone ceremony, or so the story goes. The title Canon to the Hammer of the Gods is a clear expression of the artist’s ironic approach to mythology centered on what are seen as cult figures in our society; this is an approach that oscillates between acknowledging the longing inherent to myth and a critical distance. In a time when sources are more easily available than ever before, Allen’s method of myth creation shows how arbitrary and dubious the protagonists of a new cult culture can be. 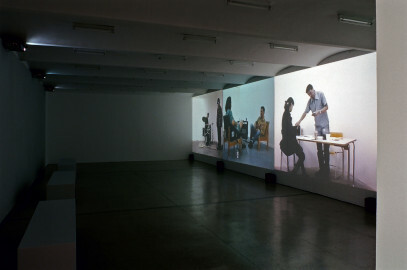 In the context of this installation, Dave Allen adds two earlier works: the sound piece Near an Open Window (2004), and the four-channel video installation Live Version (1993). During the presentation of The Mirrored Catalogue d’Oiseaux at Halle für Kunst Lüneburg (2002) recordings were made of the mockingbirds’ song after they had been listening to recordings of Olivier Messiaen’s compositions for some time, assimilating his melodies into their repertoire. Near an Open Window involves playing this recording of the mockingbirds’ modified song in the vicinity of other birds, through a loudspeaker in a natural setting such as a park, and thereby influencing and changing the natural song wherever it is heard. 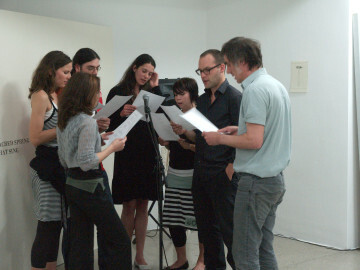 Ideally, a kind of feedback-effect between mediated and natural sound is established. Live Version shows the artist learning to play Led Zeppelin’s Stairway to Heaven (1971), one of rock history’s most famous and most covered songs: on a guitar, a bass, the drums, and as a singer. In doing so, success and failure balance each other out. Here Dave Allen addresses the dialectics of direct tradition and personal interpretation vs. an allegedly objective and academi-cally sound way of passing down knowledge. Allen sees music, and art in general, less as a medium of representation and more as a means of interaction and communication. Dave Allen, born in Glasgow in 1963, lives and works in Stockholm.